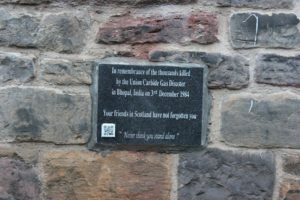 On 3rd Decem­ber 2016, peo­ple gath­ered in Edin­burgh to stand in sol­i­dar­i­ty with the peo­ple of Bhopal on the 32nd anniver­sary of the gas dis­as­ter. 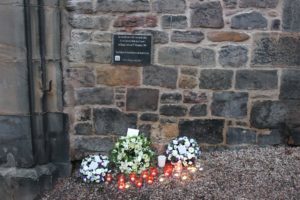 Wreaths and can­dles were placed beneath the Bhopal memo­r­i­al plaque in Greyfriar’s Kirk­yard. 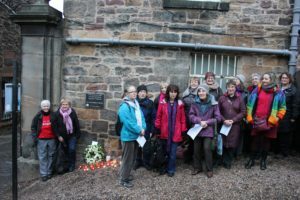 Songs were sung by Edinburgh’s rad­i­cal choir, Protest in Har­mo­ny, and short mes­sages of sol­i­dar­i­ty giv­en by Des Lough­ney from Edin­burgh TUC and Kathy Jenk­ins from the Bhopal Med­ical Appeal. their strug­gle with Indi­an author­i­ties for prop­er med­ical care. We sup­port the cam­paign to pres­surise Dow Chem­i­cals into pay­ing appro­pri­ate com­pen­sa­tion. We con­demn the dou­ble stan­dards of cap­i­tal­ism and trans nation­als that places a much high­er val­ue on US or British suf­fer­ing and death com­pared with Indi­an. In the trade union we have no doubt that the biggest chal­lenge in our times for British, US or Indi­an work­ers is to con­trol transna­tion­als. Any strug­gle to force them to respect jus­tice, health and safe­ty, envi­ron­men­tal issues, dig­ni­ty at work and human rights is one we all must sup­port.